As the rout of Saigon showed, when it came to Vietnam our "best and the brightest" were, more accurately, the worst and the dumbest. 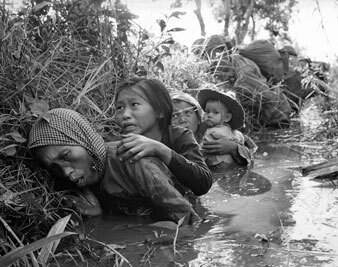 Women and children crouch in a muddy canal as they take cover from intense Viet Cong fire at Bao Trai. This article appeared in the April 12, 1975 edition of The Nation. The disastrous rout of panic-stricken troops in South Vietnam has suddenly and dramatically illuminated the folly of American intervention in that unhappy land. American military advisers on the scene express surprise that troops trained under their supervision should, in a few days and without a fight, have surrendered nearly two-thirds of the country. These troops were not overpowered or out-gunned; they abandoned perhaps $1 billion in American-supplied arms and equipment. They simply lacked the will to fight, which, in the circumstances, should surprise no one. It has been a matter of international notoriety that senior command posts in ARVN have gone to political appointees, that corruption is rampant and that morale has been a problem since the war began. Troops and people alike are utterly weary of a war that has never had much meaning for them. The Communists seized Ban Me Thuot in three days, and, according to Malcolm Browne in The New York Times, met with almost no resistance; indeed "most of the government troops remained in the town with them." When it became known in Hud that officers and their families were pulling out, along with civil administrators, panic quickly spread and the great exodus was on. Thousands of soldiers and civilians streamed down Highway 1 toward the presumed safety of Da Nang, only to have the same drama re-enacted there. In effect, Da Nang was captured by Saigon’s own troops, rather than the North Vietnamese. Browne reports: "The reign of terror of government forces in the City cost many lives and effectively kept aid from being sent in and kept refugees from getting out. The government soldiers were prepared to kill anyone, including women and children, to escape the city…. The commander of the whole northern region…spent his final day on a boat off the Da Nang coast watching helplessly as his renegade army roared through the dying city, waiting for the Northern Vietnamese to come in and restore order." Nor should there be any surprise about or any misreading of the massive civilian exodus from the Central Highlands. No doubt, some fled from political choice or because they had reason to fear reprisal. The long struggle against the French often took on aspects of a civil war, and left the Vietnamese with a heritage of mutual fears and hatred that cut across even family and village ties; in part, this accounts for the volume of the exodus. But the mass of refugees fled for all kinds of nonpolitical reasons: to quit what might become a battle zone; to escape expected retaliatory air raids from the South that never came; because they feared separation from relatives or followed husbands and fathers in the armed services who were fleeing; some from sheer panic and fright and others because they were caught up in the flood of refugees and were carried along with it. It would be difficult for even the most confirmed hawk to find in this dreadful exodus evidence of a people fighting for "national independence" or to protect their native lands from invading alien forces. The ghastly horrors and unbearable tragedy of the exodus may finally drive home the bitter truth: the North Vietnamese represent the forces seeking unification of Vietnam and its liberation from colonial control and neocolonial intervention by non-Asian powers. Of course, by failing to back Ho Chi Minh, an authentic national hero and patriot, as we had backed Tito in Yugoslavia, we made it possible for the Communists to get a hammer lock on the national liberation movement. But that does not change the basic character of the movement. Wars of national liberation can be held back, checked, prolonged, but in the end few have been suppressed in the last quarter-century. Many of our "best and brightest" and most of our "worst and dumbest" thought they knew how to use a war of liberation as part of a global strategy of "containing" communism. So they set out to win the hearts and minds of the Vietnamese, many of whom today, and with good reason, are bitterly anti-American. This initial catastrophic mistake was compounded by the Kissinger-Nixon phony Paris agreement which robbed Washington of any further leverage and, at the same time, offered Thieu no incentive to establish a regime that might have been able to negotiate a settlement. Today it is too late. "Why should the other side be interested in coalition or negotiations now?" the prominent anti-Communist Ton That Thien said to Malcolm Browne. "They have won." And he is right; for all practical purposes the war is over–for the Vietnamese but not for us. It will haunt us for decades, not so much because we made the initial mistake of backing the French or because we later withdrew American forces and denied further aid but because we betrayed our own national ideals when we intervened. It was not so much that we wanted to win the hearts and minds of the Vietnamese as that we sought for our own ends–real or imagined–to contain Russian and Chinese influence in the area. In the process we made a battleground of a country whose people wanted nothing so much as a chance to work out their historic destiny in their own way. That the Russians and Chinese backed the North with military equipment and supplies, if not with troops, does not make our intervention less a crime. That is the truth we will not soon forget.